In the last twenty-five years alone, the range of fruits and vegetables, even grains, that is available at most local markets has changed dramatically. Over the last 10,000 years, that change is almost unimaginable. This groundbreaking new work, from the editor of the highly regarded Cambridge World History of Food, examines the exploding global palate. 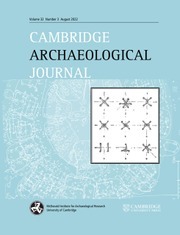 It begins with the transition from foraging to farming that got underway some 10,000 years ago in the Fertile Crescent, then examines subsequent transitions in Egypt, Africa south of the Sahara, China, southeast Asia, the Indus Valley Oceanic, Europe, and the Americas. It ends with chapters on genetically modified foods, the fast food industry, the nutritional ailments people have suffered from, famine, the obesity epidemic, and a look at the future on the food front. Food, at its most basic, fuels the human body. At its most refined, food has been elevated to a position of fine art. The path food has taken through history is a fairly straightforward one; the space which it occupies today could not be more fraught. This sweeping narrative covers both ends of the spectrum, reminding us to be grateful for and delighted in a grain of wheat, as well as making us aware of the many questions that remain unanswered about what lies ahead. Did you know. . . - That beans were likely an agricultural mistake? - That cheese making was originated in Iran over 6000 years ago? - That pepper was once worth its weight in gold? - That sugar is the world's best-selling food, surpassing even wheat? - That Winston Churchill asserted, in 1942, that tea was more important to his troops than ammunition? - That chili con carne is one of the earliest examples of food globalization? 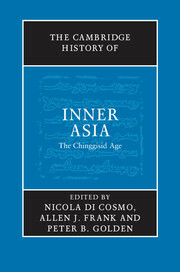 - That, by 1880, virtually every major city in America had a Chinese restaurant? - That white bread was once considered too nutritious? Kenneth Kiple reveals these facts and more within A Movable Feast. 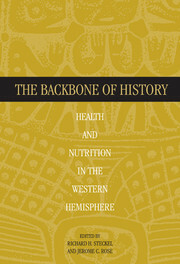 "...this slender volume distills 10,000 years of food history into just 300 pages... The strongest material examines the spread of agriculture and its ramifications... gastronomes will find scraps to nibble on...."
"...the book is filled with many intriguing culinary facts and tasty tidbits of food history." 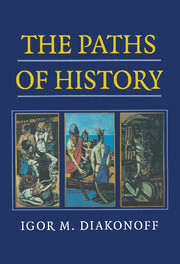 "It is a fascinating tale... it is brimming with curious titbits... 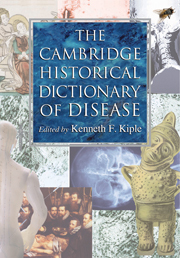 Anyone interested in the history of food for whom “The Cambridge World History of Food” seems too large a helping will find Mr Kiple's sprightly summary volume far more palatable." "In a few short paragraphs, Mr. Kiple summarizes huge ideas...."
"...delightful work... There are countless fascinating food and drink details in A Movable Feast . 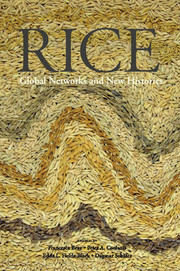 But Kiple's story of globalization is particularly interesting not for its incidentals but for the connections it makes between food-ways and what we would generally describe as real history." "...a smorgasbord of tidbits about our culinary influences, from legumes to Lent to Lindy's restaurant." 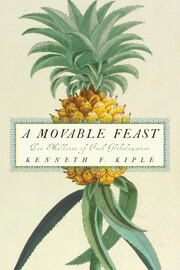 "Kenneth Kiple has written a delicious history of food, from the pickings our earliest ancestors happened to find under the trees to the amazing range of food available in the nearest supermarket today, from the first domesticated pigs to the prime pork chops we ate for dinner last night. This is a cornucopia of information about food, both profound and fun, a history, a reference book, and a collection of fascinating facts." 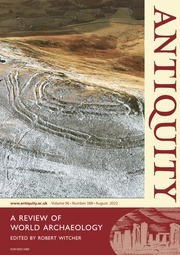 "The subtitle suggests a pretty tall order for Mr. Kiple to deliver but he does so in a way that the linkage and connections between our neolithic ancestors and ourselves is neither to be dismissed as progress nor trifled with as evidence of what has gone wrong on our planet and its food chain over the last 10,000 years. " "As the world struggles with food safety and legislating the table, looking back at how far the world's food supply has evolved can give us perspective. Thanks to food historians and authors such as Kenneth F. Kiple we can do that....There's plenty of food for thought in these pages." "...plenty of answers to intriguing questions...."
"Is this, then, a volume, you should rush out and buy? If you chief interest is in the nutritional effects of changing diets...you might well find it worthwhile." 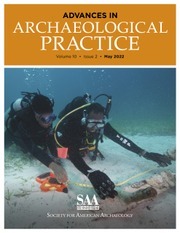 "I was pleased to find three commendable qualities in this well-produced and reasonably priced volume: it is packed with fascinating information; it is an admirable exposition on the human propensity to elaborate and find meaning in the most mundane daily tasks and material items; and it would be a useful supplementary text for a course in historical or colonial archaeology." 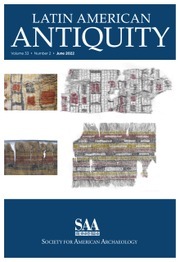 "...Kiple must be congratulated for an informative and unusually entertaining synthesis of ten millennia of history. His expertise in the study of health and disease is apparent, and he is particularly strong when examining the relationship between food preparation, consumption patterns, and well-being." 27. People and plenty in the twenty-first century. Kenneth F. Kiple is a Distinguished University Professor Emeritus at Bowling Green State University in Ohio. 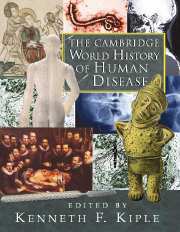 His edited collections include The Cambridge Historical Dictionary of Disease (2003); The Cambridge World History of Food (2000, with Kriemhild Conee Ornelas); Biological Consequences of European Expansion 1450–1800 (1997, with Stephen V. Beck); Plague, Pox, and Pestilence: Disease in History (1997); The Cambridge History of World Disease (1993); and The African Exchange: Toward a Biological History of Black People (1987). 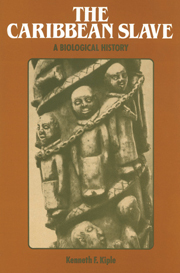 Kiple is author of The Caribbean Slave: A Biological History (1984); Another Dimension to the Black Diaspora: Diet, Disease, and Racism (1981); and Blacks in Colonial Cuba 1774–1899 (1976, with Virginia Himmelsteib King). His considerable body of written works also includes numerous articles and essays in scholarly journals and books. 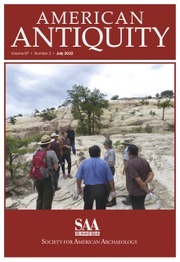 His work has been supported with grants and fellowships from institutions including the Guggenheim Foundation, the National Endowment for the Humanities, the Fulbright Foundation, the American Council of Learned Societies, the American Philosophical Society and the National Institutes of Health.